Vancouver, BC - Skyharbour Resources Ltd. (TSX-V: SYH) (OTC Grey: SYHBF) (Frankfurt: SC1N) (“Skyharbour”) is pleased to announce that the Western Athabasca Syndicate (the “Syndicate”) has commenced a diamond-drilling program on its Preston Uranium Property (the “Property”) in the southwest Athabasca Basin. 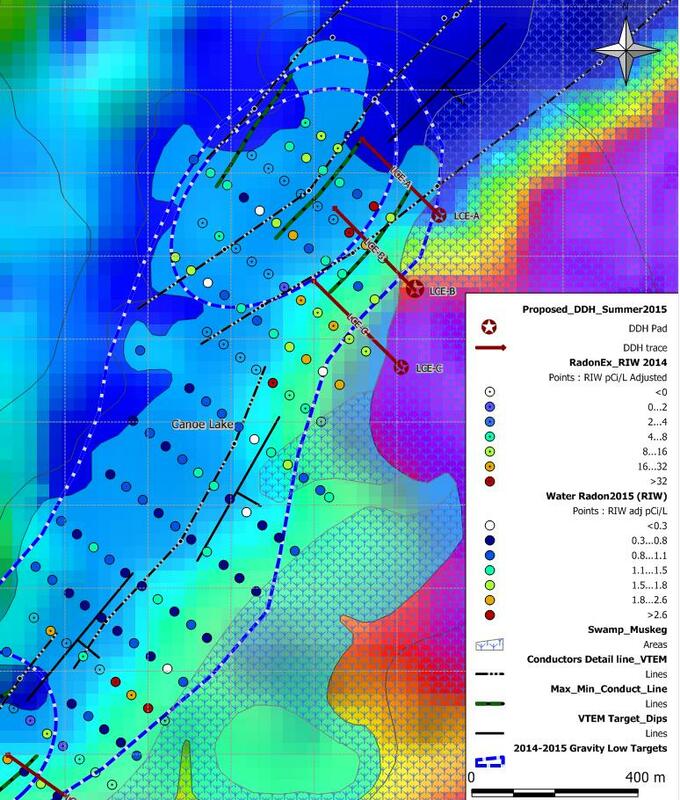 Two target areas out of a growing target base currently standing at fifteen were selected for drilling based on encouraging fieldwork results, including coincident anomalies from ground gravity, airborne and ground EM and magnetics (graphitic conductors and structures), radon, soil, biogeochem, lake sediment, and geological mapping surveys. The program’s primary drill target in the Canoe Lake region is considered to be one of the most prospective geological targets on the property. In addition, the drilling now underway is the first drill testing that this target has received. 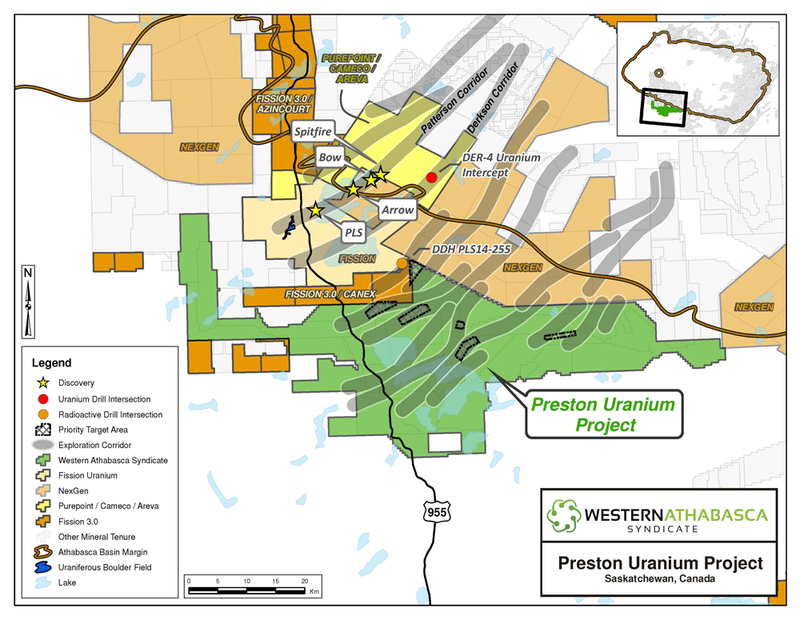 The Preston Property is strategically located proximal to Fission Uranium’s shallow, high grade Triple R deposit and NexGen Energy’s Arrow discovery in the Patterson Lake region of Northwestern Saskatchewan. Moreover, the Preston Project extends for approx. 40km length along the contiguous east-west property border with NexGen’s Rook-1 project. A total of 1,480 metres of drilling is anticipated to be completed over the coming weeks. The drilling will consist of 5 holes with drill hole lengths ranging from 150 to 400 metres and is expected to be focused at the Canoe Lake and FSA target areas during the current drill program. Based on regional data compilation, depth to the top of the target zone (being the top of basement rock) is expected to be relatively shallow, ranging from 25 metres to 75 metres for the two target areas. The majority of the work in this drill program will be focused on the Canoe Lake target where three separate drill holes will test a combination of EM conductors, complex structures, gravity lows, anomalous geochemistry and elevated radon values. This target is the highest-priority area and exhibits similar coincident geological, magnetic, EM, gravity and radon anomalies to other recent discoveries in the Western Athabasca region and elsewhere in the basin. In addition to the Canoe target area, the FSA drill target also represents a high-potential exploration prospect given the presence of coincident anomalies and indicators similar to those seen at other discovery areas in the Athabasca Basin. Management cautions that mineralization present on proximal properties is not necessarily indicative of mineralization on the Syndicate’s Property. The Western Athabasca Syndicate has carried out one of the largest regional exploration programs in the relatively underexplored south-western side of the Athabasca Basin over the last two years. A total of over $4 million in expenditures on the Preston Uranium Project has been incurred including ground gravity, airborne and ground EM and magnetics, radon, soil, silt, biogeochem, lake sediment, and geological mapping surveys, as well as boulder prospecting and a nine hole exploratory diamond drill program. Fifteen high-priority drill target areas associated with eight prospective exploration corridors have been successfully delineated through this methodical, multi-phased exploration initiative which has culminated in an extensive, proprietary geological database for the project area. Skyharbour is the operator of the Western Athabasca Syndicate. Upon completion of this drill program, Skyharbour Resources and Athabasca Nuclear will form a 50% - 50% joint venture on the Preston Project verses a joint venture between four companies with each company owning a 25% interest in the project. Rojo Resources and Noka Resources did not meet the Western Athabasca Syndicate cash call for this drill program and have thus defaulted on the Syndicate option agreement. After finishing this drill program just under $5 million in exploration expenditures will have been incurred by the Syndicate on the Preston Project over the last two years. Skyharbour holds interest in an extensive portfolio of uranium and thorium exploration projects covering over 220,000 hectares in Canada's Athabasca Basin and is well positioned to benefit from improving uranium market fundamentals with four drill-ready projects. The Company is the operator of the Western Athabasca Syndicate which controls a large, geologically prospective land package on the southwest of the Athabasca Basin of Saskatchewan. Skyharbour also owns a 100% interest in the Falcon Point (formerly Way Lake) Uranium Project on the east side of the Basin which hosts an NI 43-101 inferred resource totaling 7.0 million pounds of U3O8 at 0.03% and 5.3 million pounds of ThO2 at 0.023%. The Company owns a 60% interest in the Mann Lake Uranium project on the east side of the Basin strategically located adjacent to the Mann Lake Joint Venture operated by Cameco with partners Denison Mines and AREVA where high-grade, basement-hosted uranium mineralization was recently discovered. Skyharbour’s goal is to maximize shareholder value through new mineral discoveries, committed long-term partnerships, and the advancement of exploration projects in geopolitically favourable jurisdictions.